For millions of people, the effects of the First World War did not cease with the end of hostilities in 1918. Physical and mental trauma endured long after the armistice and the economic, social and political consequences of the conflict were felt long into the future. After the unique pressures of wartime service, some ex-soldiers found it hard to readjust to civilian life. Raynor Taylor’s brother had difficulty on his return home to his family. Our Albert, in particular, he used to go up in the town… because after demobilisation in 1919, it says a lot for the British character that there wasn’t a mutiny or something. Because there were so many soldiers coming back into civilian life who'd been tied down by strict discipline for years, so there was a tendency for them to be… they went pretty mad at times. Our Albert, he got friendly with some and yes, he never came home drunk or anything like that but they didn’t like the type of people that he was associating with. But they were people he'd been in the army with; he'd done four years with them. And I remember one night he must have been in bother or something and he came home and he'd got the loveliest black eye you’ve ever seen in your life… it was a beauty! My dad looked at him, my mother began to cry. My dad looked at him, he said, ‘Serves thee right’, he said, and that was all! In the first post-war general election campaign of December 1918, the popular wartime Prime Minister David Lloyd George promised to make Britain 'a country fit for heroes to live in'. But many of the 'heroes' returning from fighting in the war found the country had changed a great deal since 1914. William Kirk was one of many disillusioned ex-servicemen at that time. I was very dissatisfied when I came home, conditions I found. We were promised lands for heroes to live in and all that sort of thing, but when we came home, we found nothing. Everybody, everybody, wanted us – king and country wanted us – in 1914 and when we come back nobody wanted us. Because there was neither work nor money. There was poverty everywhere, everywhere. My own father was a little farmer, he was selling corn at about nine shillings a hundredweight. Produce was making nothing. There was no money, there was no sale. People were jolly hard up. Unemployment was a huge problem in the post-war years and affected millions of people – including men who had just recently put their lives on the line for their country. Fred Dixon joined the British Army in 1914. He discovered that his war record meant little when searching for work five years later. There were about a million unemployed I believe at the time of the demobilisation. And I applied for a job in Whitehall at the Ministry of Labour as a temporary clerk. And I went before a man, a Mr Dixon – my own name! He was chairman, and a lot of bearded old men round the board. Now this is where I say the old men were in the saddle again and you just didn’t stand a chance. He said, 'I'm sorry Mr Dixon but you’ve had no experience.' Well, didn’t I see red and I said, 'Pardon me, sir, but I've had more experience than anybody in this room! Thing is, it's been the wrong sort.' I said, 'When I joined the Army in 1914 I told the recruiting sergeant I couldn’t ride a horse. And he said, "We’ll bloody soon teach you!"' I said, 'They did and they spared no pains over it. Apparently I can be fitted for war but I can't be fitted for peace. So I shall know what to do another time, gentlemen.' Well ultimately, I did get a course of training, teacher training. But even then, the old men were still in the saddle. Men who had been conscientious objectors during the war also had trouble securing employment afterwards. Harold Bing, who was imprisoned for his refusal to be conscripted, remembered trying to find a teaching post in the early 1920s. But at that time if you looked through the advertisement pages of, shall we say, The Times Educational Supplement where you get all the jobs advertised, very frequently at the head of the advert was 'No CO need apply'. Advert after advert had that. Sometimes it was stated that you needn’t apply and sometimes if you did apply, well, you got turned down as soon as they knew you were a pacifist. And this lasted for some time because after I’d been three years in Cheltenham – in the summer of 1922 – and having got my degree I thought it was time to make a move and apply for a grammar school or something of that kind. And one of the jobs I applied for was at Marlow Grammar School and I was invited to an interview. And somehow in the discussion it came out that I was a CO. That was the end of that! So I didn’t get that job. In contrast, Arthur Watts found that his war experience was of use when he returned to work in his family’s firm. Went back into our company. We were a carton, cardboard carton and box makers. And of course it was overdue that I should learn about the business. I'd missed five years when I should have been learning and whilst I had lost five years shall we say of technical learning, I'd had to look after men and take charge of them. And I think that experience was very valuable and outweighed the loss of the technical knowledge, which I was able to pick up on. Despite a number of social and economic reforms in the immediate post-war years, a recession hit much of the world in the 1920s. For war widows and lower-paid workers, making ends meet was often a struggle. Although Jane Cox’s husband survived the fighting, life in post-war London was tough. Things were very, very bad in the 20s and 30s. Things were terrible, they really were. When my husband left the Merchant Navy to be at home, he couldn’t get a job. Him and a brother-in-law of mine, they used to go up to the railway stations and see if they could carry somebody's luggage for a penny. They'd go down to the docks to see if they could get half a day’s work. There was no going on the labour, you only got so many weeks and after that you got nothing. Things were bad. I think the culmination of that was in the 1926 General Strike. And I think that really put a wedge and things really started to improve after that. But between the 20s and the 30s things were very, very bad. I mean, we’re living in luxury now. Things were bad, then, very bad. I mean, you bought coal by the bucketful because you couldn’t afford to buy it any other way. You never had a penny for the gas – you had gas meters for a penny. You never had a penny for the gas. Returning to Port Talbot in south Wales after the war, ex-soldier Bertram Neyland noticed differences in his hometown. A lot of smaller houses had been built, workmen’s houses. And fields, which we used to ramble over or play in, had been given over to working class housing developments. In the main street – there is only one shopping street in Port Talbot – some of the big firms had come down there. I can remember several of the big furnishing shops had opened there. Restaurants had opened, and Port Talbot had been very bad pre-war for restaurants. And there generally was an affluent feel about life in Port Talbot when I got back. But of course it didn’t last very long because as is well know, we had industrial troubles in 1921 that knocked poor old Wales back twenty, thirty years. The wounds of the war – both physical and mental – were felt by millions long after the guns fell silent. Thousands of men were left with permanent disabilities that affected the rest of their lives. John Pegrum’s father was severely injured in the war. Well, my father served with the London Regiment. He was wounded on the Somme, actually, on the 16th July 1916. And it was a spinal wound and he was confined to a wheelchair and a motorised wheelchair that he used, to go to the poppy factory where he worked, eventually. To start with, there was no employment for them. In 1921, they found him employment in the poppy factory at Richmond. Every day he went there in his motorised wheelchair. My mother, well she had five children, I had three sisters and a brother they were all older than me. And I knew that the rent for the flat at that particular time was seven shillings a week. And that was through the Sir Oswald Stoll Foundation and it was built for the disabled by Sir Oswald Stoll. And they employed a lot of people; really they employed people in a carpentry place across the road. Quite a few went to the poppy factory in Richmond. A range of pensions were granted after the war, including to the widows of men who had been killed and to those who had been wounded. Hundreds of thousands of men were still drawing disability pensions in the 1930s, but George Peake’s was stopped in 1922. They offered me 30% and I accepted it. But later on I had to go to what they called the House of Lords board. A special board by some special doctor, I don’t know who they were. I was supposed to be represented by a solicitor to further my case. But anyway, a pal of mine was a solicitor but he didn’t turn up. They asked me who I was voting for. I said, ‘That’s my business!’ – a bit cheeky, you know. ‘Oh,’ they said, ‘right’. So they cut my pension off. I'd been drawing it four years. They cut it off. They gave me 12 pounds, a lump sum – 12 pounds. So I never had a pension after that. But I was only getting 12s and 6d a week. But 12s and 6d a week in those days was quite an amount. Men who had undergone amputations were fitted with artificial limbs. British NCO Charles Quinnell lost his leg in August 1916 during the Battle of the Somme. He recalled receiving his artificial leg soon after. By this time with my leg, I'd been through hospitals in Reading, and then a very, very nice hospital in the pavilion at Brighton and from there to Queen Mary's Hospital, Roehampton. The first leg I was fitted up with, artificial limb, weighed 14 pounds. It was very, very heavy and very cumbersome. But any rate, I was very glad to have it. I took to it like a duck to water. The very first day I had it I had to learn to walk again, I'd forgotten how to walk. You see, I'd been on crutches and the stump used to dangle down, you see. And my brain had to tell this leg to move forwards alternately with the other one. But after a day I soon got used to it. Facial disfigurement was another impact of trench warfare. New plastic surgery techniques were developed during the war, but many men suffered from negative reactions to their appearance for the rest of their lives. Joseph Pickard of the Northumberland Fusiliers was wounded by shrapnel in March 1918. There was only once and it was before I got my nose put on when I was down in Wales. And I think it was the first time I was ever out the hospital. And I wanted to go down and have a look at the place. It's got a square and all that sort of thing. Then it had. But anyhow, all the houses are built on a hillside, in rows you see. And I was going along the bottom and there was some kids, sort of playing about. And as I went past, a short time after, they got up and galloped past me, you see. I passed about two or three streets and when I got there, all the kids in the blinking neighbourhood had gathered. Looking, gawping at you. Course I still had this thing you see, I never used to bother, nothing but a plastic stuff or whatever it was, white stuff transparent nearly. And I could have taken the crutch and hit the whole blinking lot of them. I knew what they were looking at. So I turned round and I went back to hospital. I turned straight round and went back. So I was sitting one day and I thought, ‘Well, it's no good. I can’t stop like this for the rest of my life. You’ve got to face it sometime.’ So I went out again. After that I just walked out. Any time I was going anywhere, I just walked out. There was a psychological impact for many who endured the trauma of war. The effects could be felt soon after or years later, and could be short-lived or permanent. Florence Parrott served with the Women's Royal Air Force, in France. After she returned to Britain she suffered a nervous breakdown. I came home to Bletchley, nobody knew me. And then, it's very strange… I'd been out there over three years and I'd never been bad or never broke down or anything. Now, I'd only been in Bletchley three weeks and I absolutely collapsed and went to pieces. My aunty had the doctor, and he said, ‘Yes,’ he said, ‘it’s the reaction,’ he said, ‘of what's she's been through in France.’ I'd never gone to pieces before like it. But I got over it alright, it took me a few weeks, but I got over it. The high cost of the war and its long-term implications might have led many who fought in it to wonder if it had all been worthwhile. Irving Jones, who’d served as a signaller on the Western Front, believed that it was. Makes you think how lucky you… well, how very lucky I've been all the way through my life, you know, things have panned out for me alright. It was rough going at the time; I can't think that it had any adverse effect. It's the experience, it all mounted to experience. It's a life, isn’t it? See, I could look back on in my mind, my eventual mind and experiences, to think well I can speak from experience that I did do my bit and I done what I could to, we thought at the time, it was saving the country from the Germans invading this country – that was the thought we had. That they were coming over here, possibly would have, I don’t know. Anyhow, I don’t think it was a waste at all. Because it had to be done, there was no other means of doing it. British private Aneurin Williams found that the comradeship that developed between men who had served together was a clear positive effect of his wartime experiences. Well for a start it teach you a lesson to look after yourself, for a start. And I think to treat others as you'd like to be treated yourself because you was all mates together, see, there was no, very seldom there was an outcast. Say you'd get reinforcements come, they soon adapt to how you were. So it taught you that lesson I think. To be matey, as the saying is. But Tom Adlam, who earned a Victoria Cross in 1916, held a more negative view of war. One realised there was a lot of men died really unnecessarily. Because I think war is absolutely horrible. It’s a horrible thing. There should never be any more wars. It should all be done by negotiations. There may be right on both sides. But I think war is horrible. I mean, I’ve been through two, you see, because I was called up in the second war although I was not overseas in the second war. But I was bombed. And I think everything should be done to avoid war, everything that possibly can be done. I don’t mean let yourself be kicked in the pants right, left and centre. But try as hard as you can, because so many innocent people die in a war. Reflecting on one of the worst moments of the war that he experienced, British NCO Frederick Holmes found that it was useful for putting other events in his life in perspective. Leonard Gomm, who served with the London Regiment, felt bitter that some of his friends died in the war. The saddest of all, in my opinion, of those we knew so well we could depend, was Sergeant McKenzie; he really was an awfully nice man. And he had such an aptitude and a penchant for chocolate that we called him the chocolate soldier. Although he was a most efficient man and he always looked, even if we were up to our neck in mud, somehow old Mac always looked as though he'd just stepped out of a band box. And here, again, sad to relate, he was killed. And before we put him in a winding-sheet – and I buried him personally – I parted his hair, and straightened him up. And, but for a bullet wound in the back you wouldn’t have known that he was even dead. I shall never forget him; he was one of my best pals. And when these things happen, it's just another notch of bitterness that remains. In June 1919, the Treaty of Versailles formally ended the war in France and Belgium. It imposed strict conditions on Germany, including the payment of large reparations. Edwin Hiles, a schoolboy in London at the time, thought that the terms of the treaty were overly harsh. And I remember the teacher telling me about the Treaty of Versailles in 1919. And as a small child, I knew that that was wrong. And I said to the teacher, ‘Why are they treating the Germans in this terrible way, how can they pay these reparations?’ Because the reparations were millions of pounds – thousands and millions of pounds. Not only were these reparations in my own small mind, I said, ‘But they’ve taken away their colonies as well. It's wrong, surely?’ And the teacher must've been anti-German, he said, ‘What we've done is the right thing.’ But I don’t think we did the right thing, I think we treated the Germans wrongly. But the average opinion of most people was, ‘Well the Germans started the war and that’s it, they’ve got to put up with it.’ The conditions in Germany were so bad I remember the teacher saying that, if you wanted a haircut, you took an attaché case full of marks to the barbers. And, as I've said, I thought we treated the Germans wrongly and of course that brought about the Second World War. One major legacy of the war was the number of widows that were left, often with young children and little money to live on. Kitty Morter’s husband was killed on the Western Front. She described the despair she felt at his loss. During the time that he was away I was very, very lonely as I didn’t make friends very easily. And all the thoughts I had was for my husband. Times was very, very hard and I only had 12s and 6d a week and therefore I couldn’t go out and spend like anyone else. And I used to sit at night and try to do a bit of reading to pass the time away like that. But it was very, very hard and I would wonder what he was doing and if he was thinking about me. And wondering how he was going on and when I would see him again. And all things like that. So, after I found that it was officially known that he had been killed I used to pass my time away trying to make little baby clothes for my baby and eventually the baby came to be born. It was born at home but I don’t remember it being born at all. I had a very bad time, I had two doctors and I don’t remember the baby being born. And I felt I didn’t want to live, I'd no wish to live at all because the world had come to an end then, for me, because I'd lost all that I’d loved. Cultural responses to the First World War continue to shape the way in which it is remembered. Art, poetry, music and literature have all been used to express and reflect upon wartime experiences. John Nash produced some of the most enduring images of the Western Front whilst he was working as an official war artist. I remember quite well my brother was very punctilious about working for the Ministry of Information, as it was then, I think, in the First World War. He wouldn’t do any of his own work or allow me to do any, until the strain became a bit too much doing nothing but war painting. And as the summer came on we made a rule, I think he made a rule that after six o’clock we should allow ourselves to walk out on the landscape and perhaps do a peacetime landscape and forget the war paintings. And I know quite well that’s how I came to paint that Cornfield of mine which is in the Tate which everyone knows. Of course, I did that from a place nearby where we were working in this herb-drying shed in the off-period after six o’clock in the evening. What was awful about that First World War was the struggle, sheer physical struggle, apart from the danger. Those terrible marches, and getting food and things up to support trenches. And the frightful conditions. They told upon one as much as anything. The war produced a huge outpouring of literature and poetry. Among the leading poets were Wilfred Owen, Isaac Rosenberg, Edward Thomas, Robert Graves and Siegfried Sassoon. Sassoon was decorated for bravery on the Western Front in 1916. But he later began to question the war, and expressed this in his poems such as ‘Attack’, read here by its author in 1978. Flounders in mud. O Jesu, make it stop! Remembrance Day has been held every November since 1919 to commemorate the lives lost in the war. British officer Maurice Jenks was in Constantinople on the first anniversary of Armistice Day and was impressed by how it was observed. I had Armistice Day – the first Armistice Day – in Constant[inople]. I remember that very well. It was most moving. You couldn’t believe it, because it was the first time anybody had ever tried it. You just could not believe – the order came round that at the eleventh hour of the eleventh day of the eleventh month that everything would stop; there'd be a complete one minute’s silence. And the thought of that in Constantinople where everybody was rushing about yelling and shrieking all the time, we couldn’t believe it. But it happened just like that. It was extraordinary. At five to eleven there was the usual row of trains hooting, boats whistling, people yelling for alms and, you know, an absolute furore. And at a quarter of a minute past eleven it was dead silence. It's impossible to believe. But the Turkish – of course, the Turks are grand fellows, there's no doubt – and the Turkish police had made up their mind, or the Turkish government had made up their mind, that they were going to show us that they were still a disciplined nation. And they did, without any beating over the head, which I would have understood. If the policemen had come out with their great truncheons and said, 'You keep quiet,' that would have been fine. They didn’t need to. They just came and stood there and everything was quiet. It was impossible to believe. And of course, for the first time it had ever happened, it was most moving. Walter Grover served with the Sussex Regiment. He paused every Remembrance Day to think of the men he served alongside that were killed near the end of the war. I always think on 11 November when I'm standing still for that two minute silence my mind goes back to the last few pals that I knew that were killed on that fateful hour on the Sambre Canal. Just a few more days, or just a few more hours and they would have been alive. And yet, when I went across the last time and I put – I found the graves of the fellows I went over the canal with and I put some flowers there on their graves, just this year. On Remembrance Day 1920, the body of an unknown soldier was buried in Westminster Abbey to represent all the British Empire dead of the war. As part of his role with the Directorate of Graves Registration and Enquiries on the Western Front, Henry Williams was involved in the process of selecting the body. Richard Brooks, of the RAF, didn’t fight in the war but was chosen to take part in the Remembrance Day parade of 1924. He described his pride in marching past the Cenotaph – the symbolic structure in London’s Whitehall that remains the focal point for remembrance to this day. You got a sort of a pride with it. And the time we eventually went up to the Cenotaph on November the eleventh, four flights of fifty men who went up to the Cenotaph on November the eleventh. Oh it was wonderful, you know, it was one of those kicks you get in life that you never forget. You know, we went up by train from Uxbridge to Wellington Barracks. And there we had our white rifle slings, white belts and just ordinary blue uniform and overcoats, you see, it being November. And we marched from Wellington Barracks to the Cenotaph just with the contingence of all other troops. And it was a wonderful feeling, you know, you feel on top of the world. You feel smart, you feel fit, you feel good. You just feel ten feet tall, that’s all there is to it. It was a wonderful feeling. Between 1919 and 1938 a two minute silence was observed throughout Britain at 11 o'clock on 11 November. On one occasion, George Jameson, who had served in the British Army throughout the war, witnessed the power of this collective act of remembrance. When I was working in London, I was in St Stephen's House for a spell. And I rang Elsie up and said, ‘Come into London – we can nip around from St Stephen's House to the Cenotaph for the Armistice Day service.’ We came through Scotland Yard and came right opposite the Cenotaph with the whole place packed, and just stood at the back. All we could really do was listen, we couldn’t see very much. The thing that impressed me most about it was the two minute silence. It was terrific. I've never heard silence pulsate to that extent. There was no doubt about it – the human emotion that must have been pent up in that massive crowd seemed to vibrate in the air and you were conscious of it. It was terrific and I said to Elsie, ‘Did that get you like that?’ She said, ‘Yes – it was terrific wasn’t it?’ I said, ‘I never would have believed it possible that a crowd of people like that, packing Whitehall from end to end, suddenly silenced for two minutes’ – that impressed me very much. Poppies have become one of the most recognizable symbols of remembrance, inspired by the large numbers that grew in the churned-up soil of the Western Front. The first Poppy Appeal in Britain was held in 1921 to raise funds for ex-servicemen. Artificial poppies have been worn every November since, to remember those killed in conflict. Stewart Cleeve, who served with the Royal Garrison Artillery on the Western Front, thought poppies were a fitting means of commemoration. Oh, I think it's a most appropriate symbol. Because, where the fields that had been the farmers’ ground had not been too much ploughed up by shell fire, it was remarkable the number of little red poppies that came up all over the fields where there had been vegetation before. It was a very typical emblem – a very suitable emblem for Poppy Day. Couldn’t be better. I think it's a brilliant idea and I hope it'll last for so long as we have to remember wars. Having been through such a significant experience together, men who served in the First World War often formed veterans associations in its aftermath. Members would meet up for reunions, have dinner, talk and remember together. William Cowley was a member of the Gallipoli Association. Well it's a comradeship, you know, and I meet some of the old boys when I go up there. In fact, I went to Gallipoli, you know, ten years ago. We had a party and my son went – he’s an associate member of the association. And we went up to London and flew to Istanbul, stopped the night in Istanbul. Next morning we went on the Sea of Marmara, eight o'clock in the morning landed up in the Dardanelles at Chanak. So we got off there, stopped the night in Chanak – next morning, went over on the ferry to the Dardanelles. And we toured the Dardanelles, went to Cape Helles and all around, Anzac and eventually Suvla Bay. I saw the old beach of course, nobody living there. I could see it; see the beach where we landed. I brought some souvenirs home. I brought a bit of a fig tree and a bit of some stones off the beach. It was marvellous. Huge numbers of people have made visits to the former battlefields since the war ended, to visit graves and cemeteries and see where their relatives fought and died. Clifford Lane, who served on the Western Front, recalled the dangers of returning there in 1920. I took my wife soon after we were married to Belgium and we stayed for about a week. And we wanted to find the grave of her brother, which we did. But, in doing so, we found that it was still dangerous, very dangerous, to travel across fields and things like that because there were still shells, bombs, anything lying about. Every now and then there'd be an explosion where the, I suppose, the Belgian Army were destroying live shells, you see. Every now and again people would shout to us, ‘Stop! Don’t come any further.’ So I thought, ‘To hell with this, I'm not going to risk my wife’s life and my own life again!’ So we stopped exploring after that. We kept to the main roads, the Menin Road. And we never had any more trouble, but it was really highly dangerous for some years after that. The Menin Gate Memorial to the Missing in Ypres is one of the best known commemorative sites in the world. Since 1928, the Last Post has been sounded at a ceremony there every evening. This recording of it was made in 1984. At a Remembrance Day service in 1934, Edward Prince of Wales – the future King Edward VIII – read one of the most poignant poems associated with First World War remembrance, 'For the Fallen' by Laurence Binyon. As time passed, those who lived through the First World War were able to gain perspective on both their experiences and the concept of war in general. Many who enthusiastically joined up to fight in the years 1914-1918 later changed their opinion on war, including former soldier George Clayton. 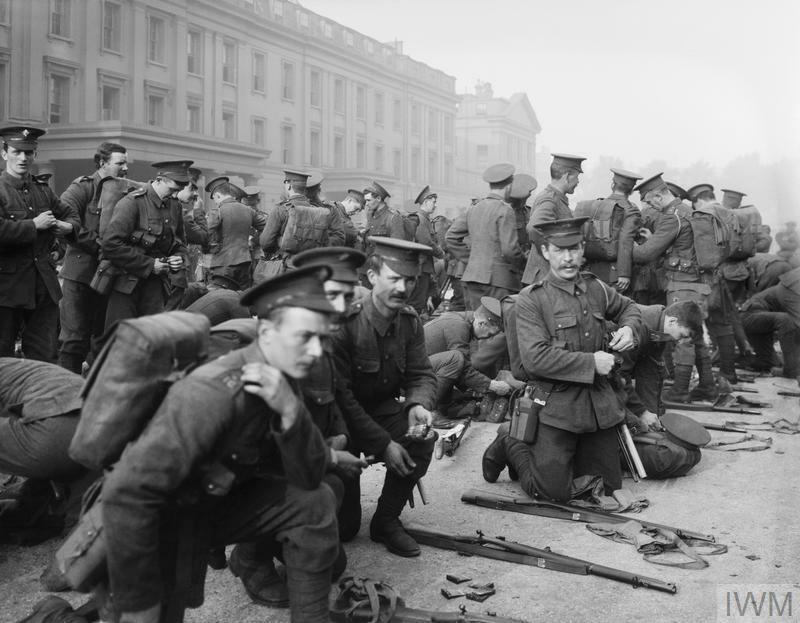 This is the last of IWM’s podcast series marking the centenary of the First World War. We’d really like to know what you think of all these podcasts. So, please rate us or leave a comment on iTunes. If you have followed the whole series, thank you for listening. Visit iwm.org.uk to find out more about the First World War. 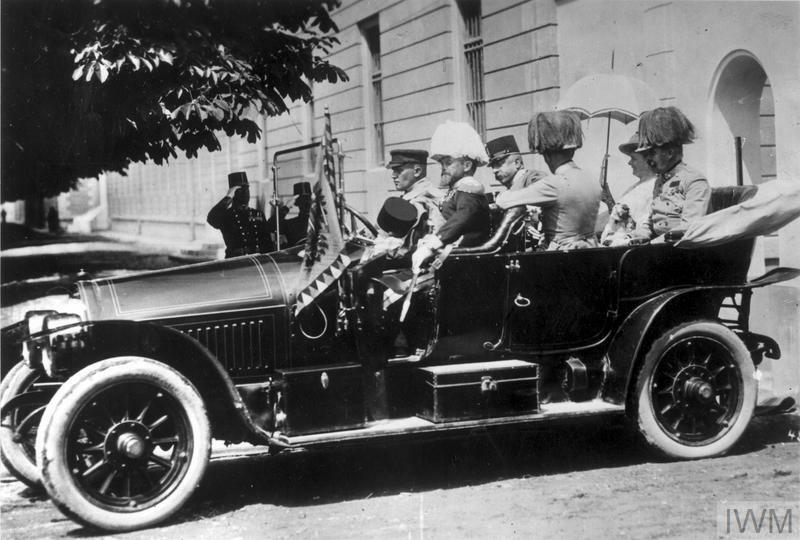 Episode 3: When war broke out in August 1914, Britain’s regular army numbered only 250,000. A recruitment campaign was immediately launched to swell the ranks. Hear about the effects of the recruiting drive on young men of Britain to join the army. Episode 2: After weeks of speculation and mounting tension, Great Britain declared war on Germany on 4 August 1914. Hear how people reacted to this news in episode two. Episode 1: Hear the story of how an assassination set off a chain of events that led to war and changed the course of lives around the world.